Giant Wooden Arrow Growth Chart - Lovely Etc. 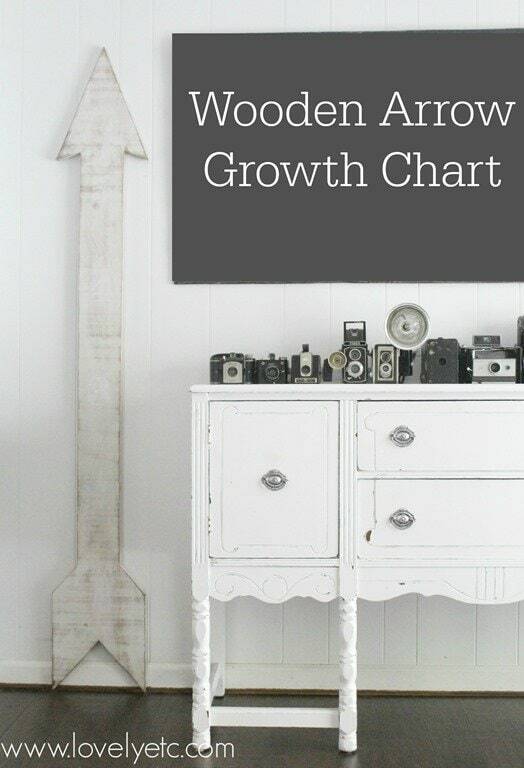 I am so excited to share with you Griffin’s new giant wooden arrow growth chart! 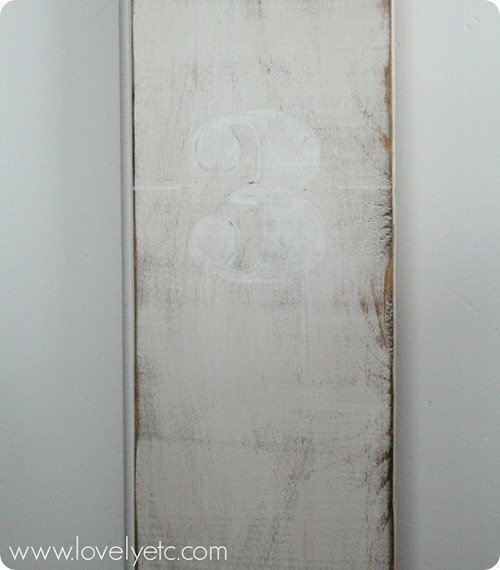 I have been wanting to make a DIY growth chart for Griffin for awhile now. But I didn’t want anything cutesy or childish; I wanted something grown-up enough to display in the family room. I want this to be something our family will have around for a long time – to keep track of future children too, even grandchildren – so it needed to be something classic. Nothing too trendy that I would want to hide away the next time I redecorate. But I also wanted it to have some personality. I started with a 1’x 8’ shelf board. (These cost about $15). I drew my arrow shape onto the board using a pencil and a straight edge and then cut it out with my trusty jigsaw and sanded the rough edges. It turns out painting the perfect weathered finish is really simple. 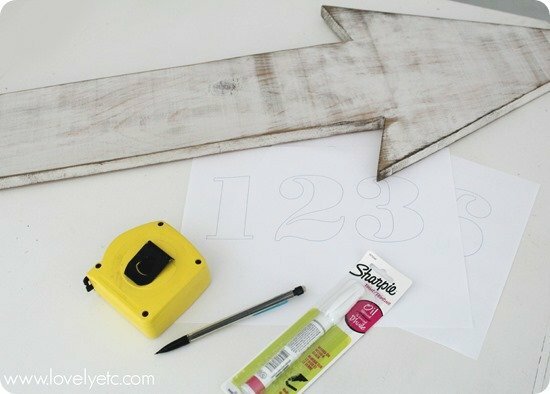 Paint the entire arrow with one coat of the white paint of your choice and let it dry. Lightly sand the arrow with 100 grit sandpaper to expose some of the raw wood and grain. Then use a clean rag to wipe on a coat of dark stain. Pour a little mineral spirits onto another clean cloth and wipe the excess stain off of the painted finish. This will leave you with a perfectly weathered finish. I decided to go really subtle with the growth chart numbers. I chose to only mark my arrow at each foot mark, so I used a tape measure and a pencil to mark where each number should go. I printed an outline of the numbers I wanted to use. 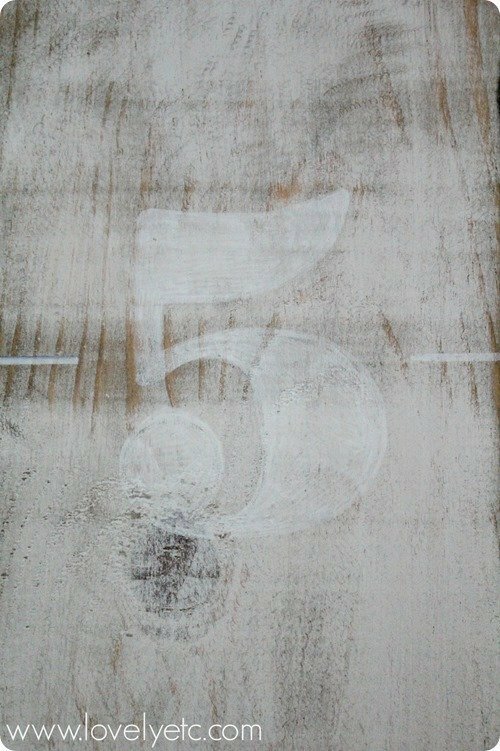 I cut out each number and used a white oil based Sharpie paint pen I picked up at Michaels to trace each number onto the wood. (Be sure to look out for some upcoming special deals on Sharpie paint pens in Michaels stores on online at michaels.com.) This made it so easy to paint on my numbers in exactly the font I wanted. I also added tic marks next to each number at the exact measurement mark. Once I had traced each number, I colored them in with my Sharpie paint pen. Don’t worry about getting your coloring perfectly even; once everything is dry, just lightly sand each number with 150 grit sandpaper and it will even out nicely. And that’s it! I love the white on white numbers. You can see the numbers perfectly but they aren’t all in your face. I’m going to be using my Sharpie paint pen to mark each new height on here too. I love how it turned out and can definitely be happy having this hanging around the house for years to come. Anyone else out there thinking about attempting a DIY growth chart? 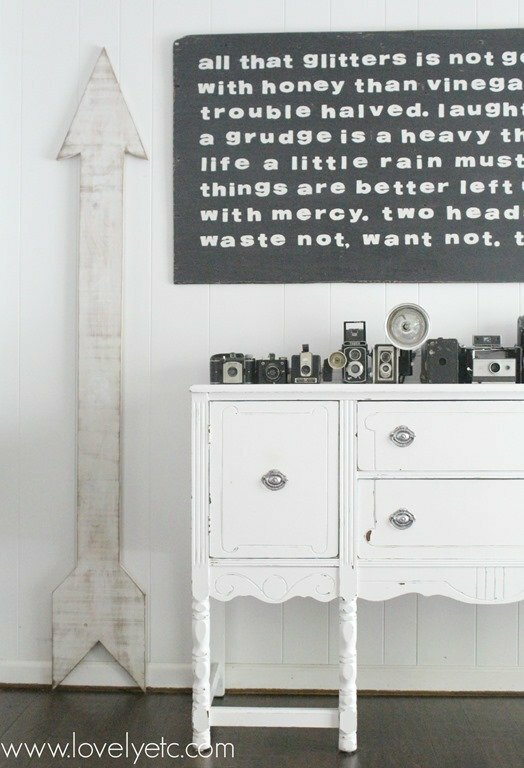 Or for that matter, I think a chunky wooden arrow like this would look pretty awesome just as wall décor even without kids around. And please tell me that I am not the only one who is still loving arrows! Oh this is gorgeous! I never would have thought to make something like this! Thanks Brittany! I’m pretty in love with how it turned out myself! Can you tell me was your arrow 8 feet tall once you were finished with it? What I’d the name of the stain you used? My arrow is a little more than six feet tall. I cut off a little of the length when I cut it into an arrow shape. My husband laughed at me for making a growth chart that is six feet tall but I said, hey what if our kids are really tall and I want to keep measuring their heights when they are teenagers! No reason to limit the possibilities! 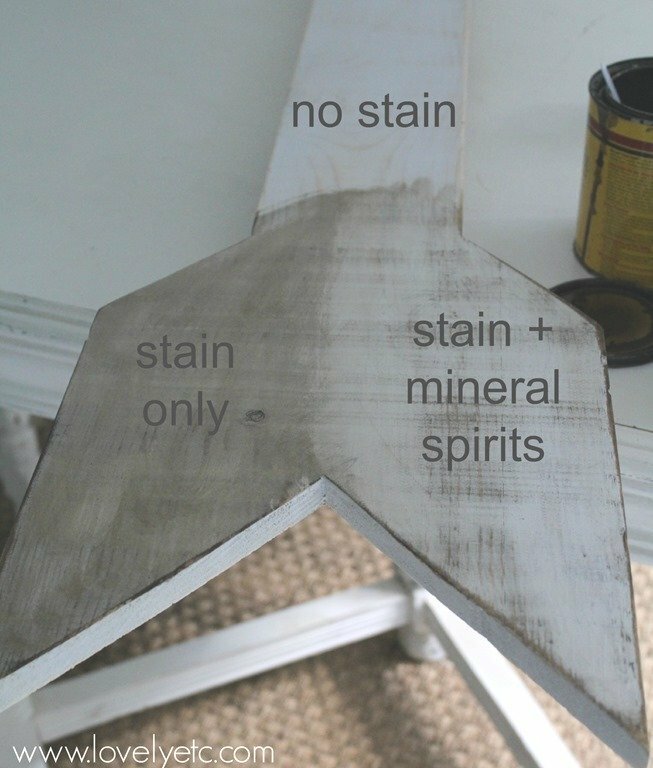 And the stain I used was dark walnut by Minwax – it is my go to stain and color. I love this so much! The Sharpie Paint Markers are so easy to use too! Thanks Sonya! And you are so right – they are incredibly easy to use. This turned out incredible! I love it! That is fabulous. Oh how I wish my kids were little enough to make one of these. Thanks Jenise! I love how it turned out too and it was soo simple to do – love when that happens. I love this, Carrie! Such a fabulous project! Pinning and sharing. Thanks Tasha! Always love pins and shares! Thanks Lauren! I love those huge ruler ones too. I was planning to make one for the longest time until inspiration struck for an arrow growth chart! This growth chart is too cute! I would’ve never thought of making something like this. It’s great!! I would love it if you linked this up to my Motivate Me Monday linky party at IT’S A ginger SNAP. Thanks so much Katie! My brain seems to be constantly thinking DIY! I LOVE this!!! Pinning it. What a fun and beautiful idea for decor!! Love it. Pinning. Thanks Elizabeth! Always love pins! This turned out so lovely! Much better than the store-bought vinyl one that I have! Thanks Melanie! Although the upside of vinyl is it’s a little easier to transport for sure. I’m just happy to have finished this in a fairly timely manner – who knows when the baby book will be complete! Wish I had thought of this when my kids were small! Cute idea – and you can take it with you if you move!! Thanks Susan! Big and unwieldy as it is, this will definitely be coming with us whenever we move! Love how the numbers just kind of blend in! It looks perfect in that space! Thanks Ashley! I love how the numbers blend in too – they are definitely there but they aren’t in your face at all. This is adorable! I love it. Such a beautiful piece of decor. Thanks Taryn! I’ve always loved your wooden growth chart too! Thanks Anna! I’m pretty thrilled with how it turned out myself! I just LOVE this. So glad i “stumbled” onto your site. I will try making this for a baby gift. I also LOVE the subway art over the table. Have you ever shared this? I would love to try making it..the ‘you get more flies with honey than vinegar’ I have heard all my life. Thanks Malinda! The growth chart would be an awesome baby gift! I mentioned a little bit about the subway art in this post: https://www.lovelyetc.com/2011/11/favorite-nook_14/. But I am thinking I may share more about it in the next few weeks with a better tutorial. What a cute growth chart!! Love the numbers on it too! 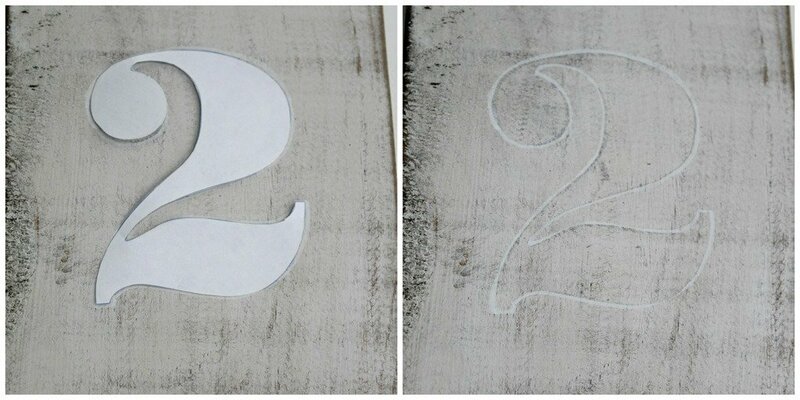 Would love for you to share it at our link party on my blog please (or any other DIY). Love it! This is really neat, Carrie! I love the arrow idea! Thanks Kristi! 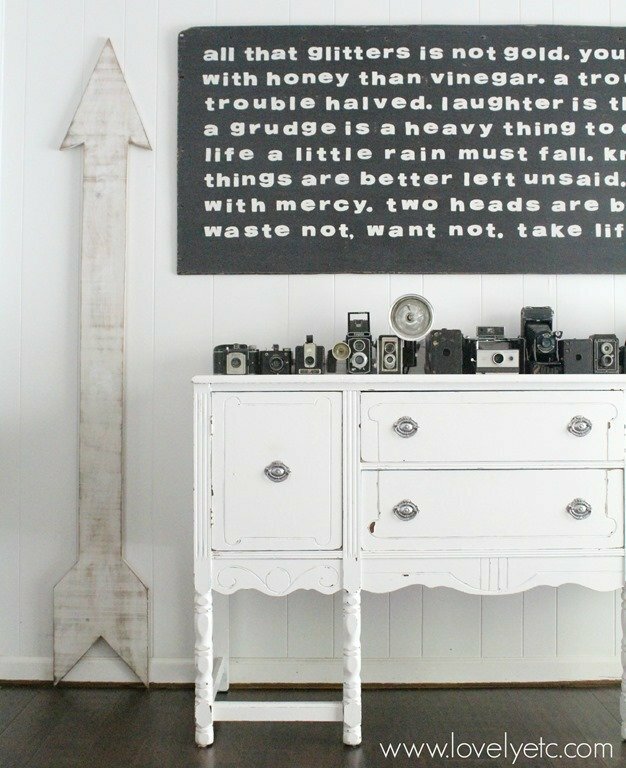 Arrows just seemed like the perfect thing for a growth chart! Loving arrows right now. This is fabulous & I need one in my new house! I’m not the crafter and am wondering how I can get my hands on one? Do you take orders? Karissa, Thanks so much! I hadn’t really considered selling these but I am definitely looking into it now. My biggest question is about shipping since this is pretty large. I will look into it and get back to you. That is really adorable. Great job! Thanks Sarah! I’m pretty excited about how it turned out myself! Do you have a site where you would be selling the growth chart arrow? Amanda, I am considering making a few of these to sell. I need to look into shipping options and costs first. If I decide to sell them, I will let you know! I’m absolutely loving this, and yes I’m still loving arrows! Thanks Cindy! Glad I’m not the only one still in love with arrows! Ah! I lovvvve this! I have been wanting to make a growth chart for ages and this is absolutely perfect!! Thank you SO much for sharing! Thanks Stacey! Good luck with your own version! LOOOOOVE this cute idea! I love arrows so much. Saw this over at Lolly Jane! Thanks Kristen! Arrows are definitely the best! wow love this growth. 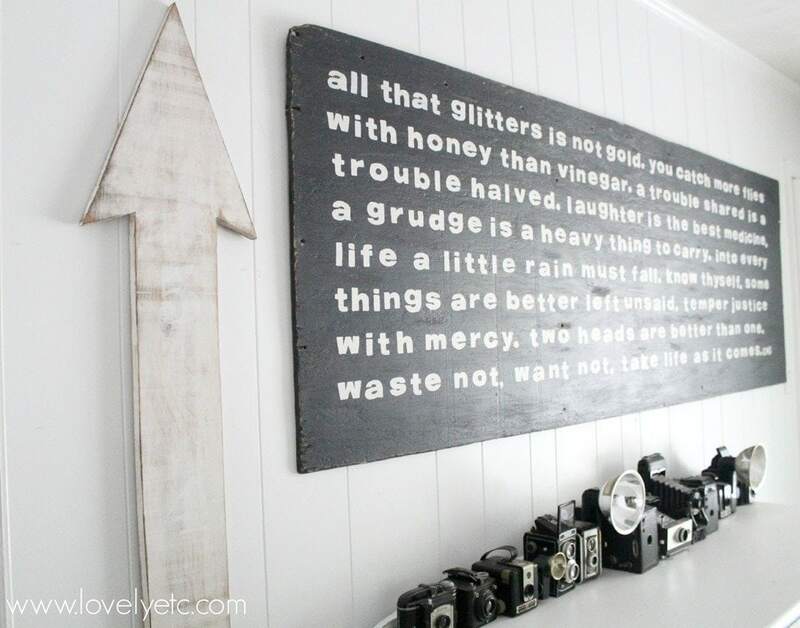 I like that is a really cool home decor piece and growth chart in one. The numbers aren’t too noticeable so I like that too. I will be featuring this over at Hawthorne and Main.com for my favorite things friday. Thanks Shonee! That is exactly why I love it too – it works great for recording heights but for all the rest of the time, it just looks really cool. And thanks for the feature – I’ll have to be sure to stop by and check it out! Do you have the dimensions? I am looking into making this, and am unsure as to where to start with the shape dimensions. Thanks! Mollee, I started with a board that was 8′ x 1′. The final arrow is a little more than six feet tall. The bottom (feathers) of the arrow are the entire width of the board and the skinnier (shaft) part of the arrow is five inches wide. The length of the arrow head is close to fourteen inches. Hope that helps – good luck! I was hoping to may be ale to tell me what font you used for the numbers. I really love this! Thanks Jessica, I believe I used the font Bodoni Black (which is standard on my computer with Microsoft Word). Good luck if you decide to make one! Where did you buy the shelf board? 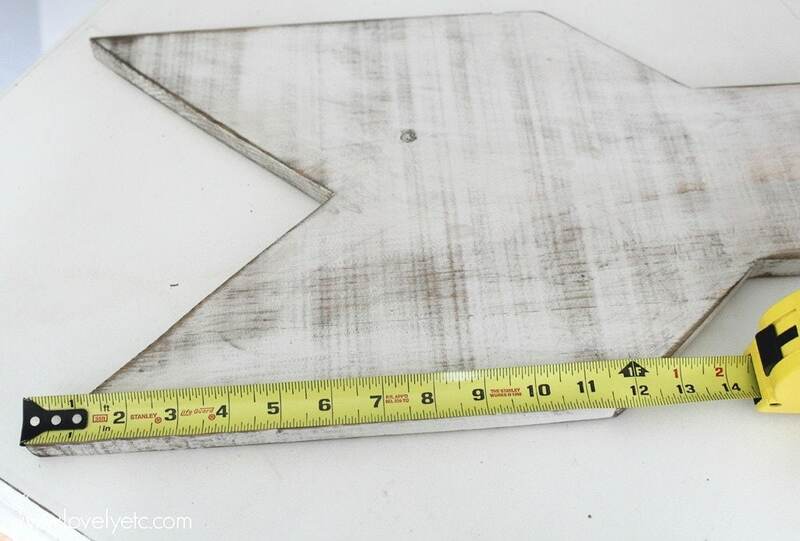 I just bought it at Lowes – it was in the aisle with lots of smaller pieces of plywood and cut boards. Found this via Pinterest and absolutely LOVE this growth chart!! I’ve been meaning to make one of the popular giant ruler growth charts, but I do love this arrow one so much more! I mean, how perfect is an arrow for a growth chart?! Thanks for sharing this great idea! Thanks Jen! I thought the same thing – you can’t get more appropriate for a growth chart than an arrow. We have absolutely loved ours so far. 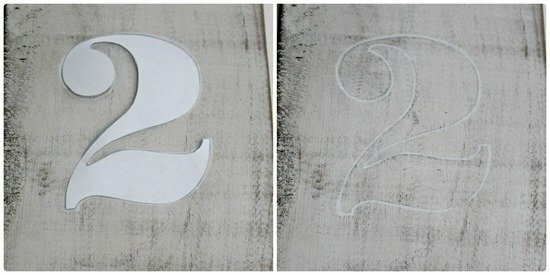 Do you remember how large your numbers were – what font size? Thanks so much!! I’m sorry I don’t remember what font size I used. 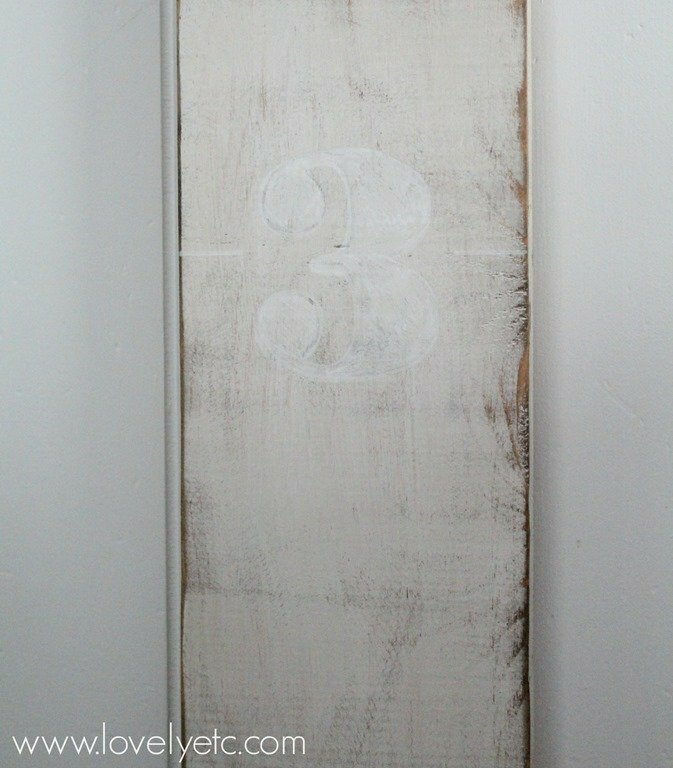 But I measured the numbers on my growth chart and they are 3.25 inches high. You should be able to figure out the right font size by printing a few samples and measuring them. Hope that helps!